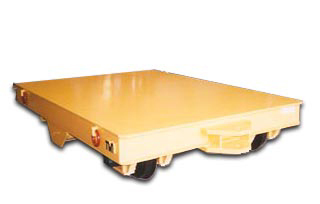 Industrial Transfer Cars by Allegheny Material Handling, Inc.
Our line of Industrial Transfer Cars are designed to accommodate the needs of a wide range of industries including Steel, Aluminum, Automotive, Stamping, Heavy Manufacturing and several others. 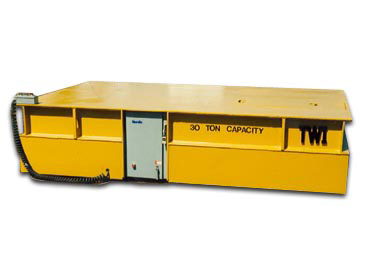 These units are designed to operate on floor mounted rails and are used to transport heavy materials across crane bays or in areas not serviced by an overhead crane. 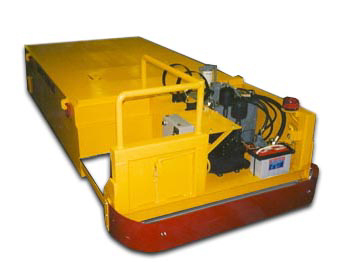 A variety of drive and control systems are available. Drive systems include gear reducer axle drives and individual wheel drives. 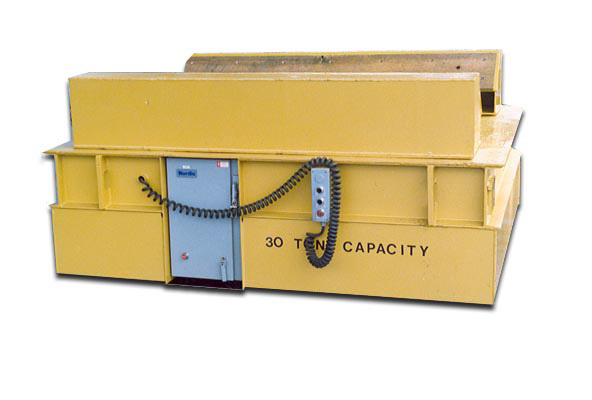 All drive systems are powered by 230/460 Volt AC supply, 24 to 72 Volt DC power supply, self-contained hydraulic power, propane, diesel or gasoline engines. 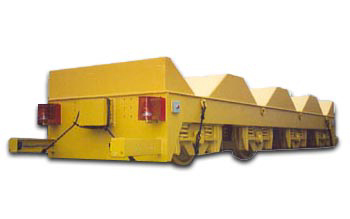 A typical unit is equipped with a hand held pendant control that is used by the operator to control the transfer car movement along the track. 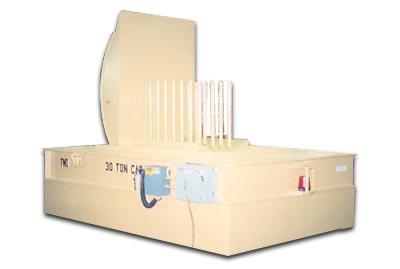 With an average travel speed of 50 FPM a operator can walk along side the car to operate the unit. The pendant can be provided to be mounted on any of the 4 corners of the vehicle to allow the operator to walk along the leading end of the vehicle during operation. Allegheny's transfer cars come available with semi-automatic and fully automatic control systems to meet the needs of specialized applications. All control systems feature Allen-Bradley, GE or Square "D" components. 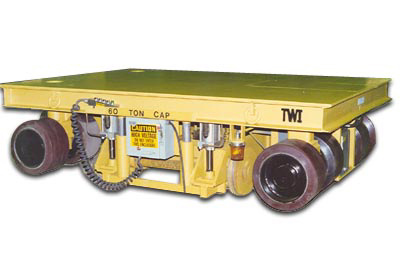 With load capacities that range from 5 Ton to 300 Ton, our Industrial Transfer Cars are equipped with single and double flange steel wheels, in 12" to 30" diameters. 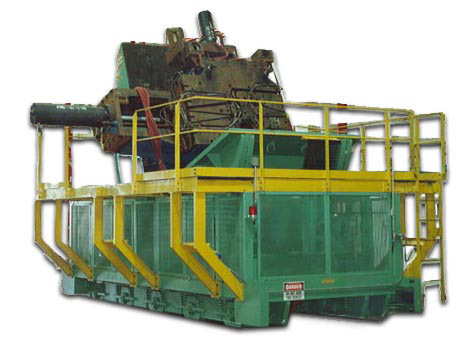 Our wheels are machined to "press-fit" tolerances mounted on either stub or thru axles. 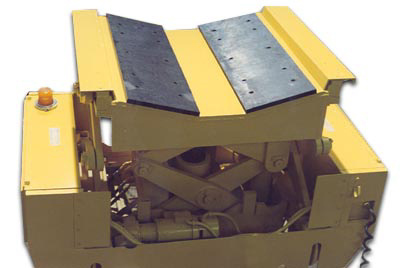 Each axle assembly is mounted to the frame of the vehicle using pillow block or "AP" bearing assemblies. 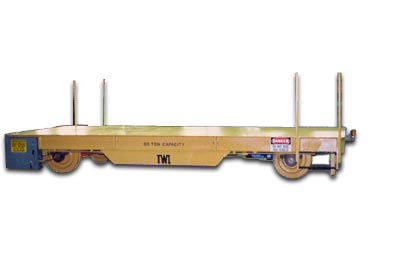 A number of suspension features are available on Allegheny transfer cars including "shock pads", "coil spring suspension" and articulating truck assemblies. These suspension features provide protection for the vehicle from impact loading and poor track conditions. 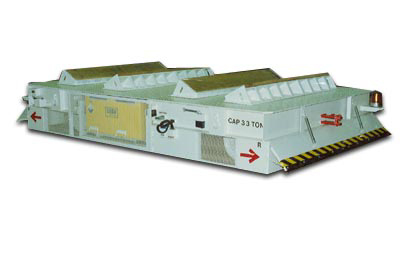 The load deck area of the unit can be equipped with load chocks for handling coils of steel or aluminum and also can include jigs and fixtures for handling specialty loads. 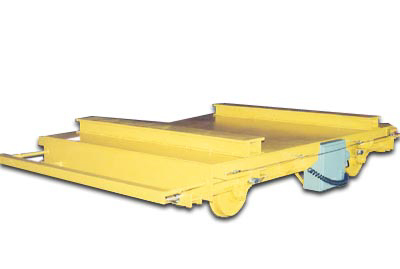 Vehicles Allegheny Material Handling has designed have been equipped with a scissor lift decks and an Upender mounted within its deck. Any deck surface can be equipped with oak plank, safety tread plate or neoprene. All units are equipped with state of the art safety features including safety lights, horns, bumpers, dead man controls and mushroom type emergency stop buttons. Allegheny vehicles equipped with semi-automatic and fully automatic control systems come equipped with a wide range of fully automatic safety controls.